The ROHO SOFFLEX 2 Mattress Overlay is a non-powered, air filled, adjustable, zoned, reactive, full support surface that is intended to conform to an individual’s shape to provide skin/soft tissue and deep tissue injury protection and an environment to facilitate wound healing. The SOFFLEX 2 Mattress Overlay provides individualized pressure, shear and friction management through force redistribution to an individual’s shape. Flexible, interconnected air cells can be adjusted to match the individual’s body contours, providing individualized therapy and critical skin protection. The SOFFLEX 2 has three sections for an individualized fit. Each of the three sections easily snap together to form a complete mattress overlay and can be adjusted per section to address the specific needs of the individual’s body shape and size. Have a history of skin/soft tissue breakdown and/or any stage pressure ulcer (including deep tissue injury), skin grafts, or myocutaneous flap surgery. Require a mattress overlay that provides an individualized fit. Are at risk of developing pressure ulcers and/or tissue injury. Adjustable to shape and weight and to changes in individual’s position over time. 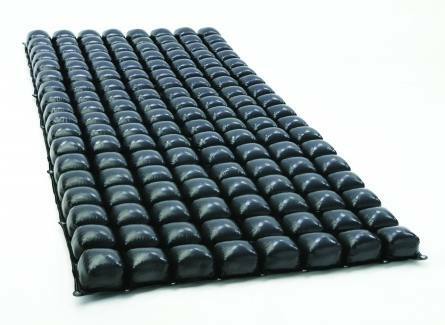 Promotes a comfortable environment to assist with pain management. Accommodates other positioning devices beneath the overlay. Segmented for use in positions other than 180°. Hydrostatic distribution of load across the entire contact area. Provides 3in. (7.5 cm) of immersion. Does not use electricity (no noise or heat from a pump, no issues transporting patient’s bed). Sections are easily cleaned and can be disinfected and can be patched to extend use. Cover is machine washable and can be disinfected. Includes: SOFFLEX2 Cell Pad (3 sections), operating instructions, registration card, hand inflation pump, repair kit, straps, ROHO® Reusable Mattress Overlay Enclosure Cover. My client purchased this after trying various pressure relieving overlays which weren\'t suitable for her needs , This is perfect for her requirements and she is now a lot more comfortable in bed and one less worry of her developing pressure sores. I would highly recommend this overlay . One happy customer !